This article is about the Fourth International prior to 1963. For subsequent developments, see Fourth International (post-reunification). For other uses, see Fourth International (disambiguation). It has been suggested that Fourth International (post-reunification) be merged into this article. (Discuss) Proposed since December 2018. The Fourth International (FI) is a revolutionary socialist international organisation consisting of followers of Leon Trotsky, or Trotskyists, with the declared goal of helping the working class overthrow capitalism and work toward international communism. The Fourth International was established in France in 1938 as Trotsky and his supporters, having been expelled from the Soviet Union, considered the Third International or Comintern to have become lost to Stalinism and incapable of leading the international working class to political power. Thus, Trotskyists founded their own competing Fourth International. Today, there is no longer a single cohesive Fourth International. Throughout the better part of its existence, the Fourth International was hounded by agents of the Soviet secret police, repressed by capitalist countries such as France and the United States and rejected by followers of the Soviet Union and later Maoism as illegitimate. [not in citation given] It struggled to maintain contact under these conditions of illegality and repression around much of the world during World War II because when workers' uprisings did occur they were often under the influence of Soviet-inspired, anarchist, social democratic, Maoist, or militant nationalist groups, leading to defeats for the FI and its Trotskyists, who seldom gathered similar support. [not in citation given] Despite this, many parts of the world, including Latin America, Europe and Asia, continue to have large Trotskyist groupings who are attracted to its anti-Stalinist positions and its defense of workers' internationalism. Quite a few of these groups carry the label Fourth Internationalist either in their organisation's name, major political position documents, or both. In line with its Trotskyist underpinnings, the Fourth International tended to view the Comintern as worthy of conditional support even considering its corruption and although it regarded its own ideas as more advanced and thus superior to those of the Third International, it did not actively seek the Comintern's destruction. It does not operate as a cohesive entity in the manner of the prior internationals. The FI suffered a major split in 1940 and an even more significant split in 1953. A partial reunification occurred in 1963, but the international never recovered enough to re-emerge as a single transnational grouping. Trotskyists' response to that situation has been in the form of its many Internationals, with some divided over ideas of which organisation represents the true political continuity of the Fourth International. Trotskyists regard themselves as working in opposition to both capitalism and Stalinism. Trotsky advocated proletarian revolution as set out in his theory of "permanent revolution", and believed that a workers' state would not be able to hold out against the pressures of a hostile capitalist world unless socialist revolutions quickly took hold in other countries as well. This theory was advanced in opposition to the view held by the Stalinists that "socialism in one country" could be built in the Soviet Union alone. Furthermore, Trotsky and his supporters harshly criticized the increasingly totalitarian nature of Joseph Stalin's rule. They argued that socialism without democracy is impossible. Thus, faced with the increasing lack of democracy in the Soviet Union, they concluded that it was no longer a socialist workers' state, but a degenerated workers' state. Trotsky and his supporters had been organised since 1923 as the Left Opposition. They opposed the bureaucratization of the Soviet Union, which they analysed as being partly caused by the poverty and isolation of the Soviet economy. Stalin's theory of socialism in one country was developed in 1924 as an opposition to Trotsky's Theory of Permanent Revolution, which argued that capitalism was a world system and required a world revolution in order to replace it with socialism. Prior to 1924, the Bolsheviks' international perspective had been guided by Trotsky's position. Trotsky argued that Stalin's theory represented the interests of bureaucratic elements in direct opposition to the working class. Eventually, Trotsky was sent into internal exile and his supporters were jailed. However, the Left Opposition continued to work in secret within the Soviet Union. Trotsky was exiled to Turkey in 1928. He moved from there to France, Norway and finally to Mexico. He was assassinated on Stalin's orders in Mexico in August 1940. A political international is an organisation of political parties or activists with the aim of co-ordinating their activity for a common purpose. There had been a long tradition of socialists organising on an international basis, and Karl Marx had led the International Workingmen's Association, which later became known as the "first international". After the International Workingmen's Association disbanded in 1876, several attempts were made to revive the organisation, culminating in the formation of the Socialist International (Second International) in 1889. This was disbanded in 1916 following disagreements over World War I. Although the organisation reformed in 1923 as the Labour and Socialist International, supporters of the October Revolution and the Bolsheviks had already set up the Communist International (Comintern), which they regarded as the Third International. This was organised on a democratic centralist basis, with component parties required to fight for policies adopted by the body as a whole. By declaring themselves the Fourth International, the "World Party of Socialist Revolution", the Trotskyists were publicly asserting their continuity with the Comintern, and with its predecessors. Their recognition of the importance of these earlier Internationals was coupled with a belief that they eventually degenerated. Although the Socialist International and Comintern were still in existence, the Trotskyists did not believe those organisations were capable of supporting revolutionary socialism and internationalism. The foundation of the Fourth International was therefore spurred in part by a desire to form a stronger political current, rather than being seen as the communist opposition to the Comintern and the Soviet Union. Trotsky believed that its formation was all the more urgent for the role he saw it playing in the impending World War. In the early 1930s, Trotsky and his supporters believed that Stalin's influence over the Third International could still be fought from within and slowly rolled back. They organised themselves into the International Left Opposition in 1930, which was intended to be a group of anti-Stalinist dissenters within the Third International. Stalin's supporters, who dominated the International, would no longer tolerate dissent. All Trotskyists, and those suspected of being influenced by Trotskyism, were expelled. Trotsky claimed that the Third Period policies of the Comintern had contributed to the rise of Adolf Hitler in Germany, and that its turn to a popular front policy (aiming to unite all ostensibly anti-fascist forces) sowed illusions in reformism and pacifism and "clear[ed] the road for a fascist overturn". By 1935 he claimed that the Comintern had fallen irredeemably into the hands of the Stalinist bureaucracy. He and his supporters, expelled from the Third International, participated in a conference of the London Bureau of socialist parties outside both the Socialist International and the Comintern. Three of those parties joined the Left Opposition in signing a document written by Trotsky calling for a Fourth International, which became known as the "Declaration of Four". Of those, two soon distanced themselves from the agreement, but the Dutch Revolutionary Socialist Party worked with the International Left Opposition to declare the International Communist League. This position was contested by Andrés Nin and some other members of the League who did not support the call for a new International. This group prioritised regroupment with other communist oppositions, principally the International Communist Opposition (ICO), linked to the Right Opposition in the Soviet Party, a regroupment which eventually led to the formation of the International Bureau for Revolutionary Socialist Unity. Trotsky considered those organisations to be centrist. Despite Trotsky, the Spanish section merged with the Spanish section of ICO, forming the Workers' Party of Marxist Unification (POUM). Trotsky claimed the merger was to be a capitulation to centrism. The Socialist Workers' Party of Germany, a left split from the Social Democratic Party of Germany founded in 1931, co-operated with the International Left Opposition briefly in 1933 but soon abandoned the call for a new International. In 1935, Trotsky wrote an Open Letter for the Fourth International, reaffirming the Declaration of Four, while documenting the recent course of the Comintern and the Socialist International. In the letter, he called for the urgent formation of a Fourth International. The "First International Conference for the Fourth International" was held in Paris in June 1936, reports giving its location as Geneva for security reasons. This meeting dissolved the International Communist League, founding in its place the Movement for the Fourth International on Trotsky's perspectives. The foundation of the Fourth International was seen as more than just the simple renaming of an international tendency that was already in existence. It was argued that the Third International had now degenerated completely and was therefore to be seen as a counter-revolutionary organisation that would in time of crisis defend capitalism. Trotsky believed that the coming World War would produce a revolutionary wave of class and national struggles, rather as World War I had done. Stalin reacted to the growing strength of Trotsky's supporters with a major political massacre of people within the Soviet Union, and the assassination of Trotsky's supporters and family abroad. He had agents go through historical documents and photos in order to attempt to erase Trotsky's memory from the history books. According to the historian Mario Kessler, Stalin's supporters turned to anti-semitism to whip up sentiment against Trotsky (as Trotsky was a Jew). Stalin's daughter later claimed that his fight with Trotsky laid the foundations for his later anti-semitic campaigns. The International's rationale was to construct new mass revolutionary parties able to lead successful workers' revolutions. It saw these arising from a revolutionary wave which would develop alongside and as a result of the coming World War. Thirty delegates attended a founding conference, held in September 1938, in the home of Alfred Rosmer just outside Paris. Present at the meeting were delegates from all the major countries of Europe, and from North America, although for reasons of cost and distance, few delegates attended from Asia or Latin America. An International Secretariat was established, with many of the day's leading Trotskyists and most countries in which Trotskyists were active represented. Among the resolutions adopted by the conference was the Transitional Programme. The Transitional Programme was the central programmatic statement of the congress, summarising its strategic and tactical conceptions for the revolutionary period that it saw opening up as a result of the war which Trotsky had been predicting for some years. It is not, however, the definitive programme of the Fourth International – as is often suggested – but instead contains a summation of the conjunctural understanding of the movement at that date and a series of transitional policies designed to develop the struggle for workers' power. At the outbreak of World War II, in 1939, the International Secretariat was moved to New York City. The resident International Executive Committee failed to meet, largely because of a struggle in the U.S. Socialist Workers Party (SWP) between Trotsky's supporters and the tendency of Max Shachtman, Martin Abern and James Burnham. The secretariat was composed of those committee members who happened to be in the city, most of whom were co-thinkers of Shachtman. The disagreement centred on the Shachtmanites' disagreements with the SWP's internal policy, and over the FI's unconditional defence of the USSR. Trotsky opened a public debate with Shachtman and Burnham and developed his positions in a series of polemics written in 1939–1940 and later collected in In Defense of Marxism. Shachtman and Burnham's tendency resigned from the International in early 1940, alongside almost 40% of the SWP's members, many of whom became founder members of the Workers Party. In May 1940 an emergency conference of the International met at a secret location "somewhere in the Western Hemisphere". It adopted a manifesto drafted by Trotsky shortly before his murder and a range of policies on the work of the International, including one calling for the reunification of the then-divided Fourth Internationalist groups in Britain. Secretariat members who had supported Shachtman were expelled by the emergency conference, with the support of Trotsky himself. While leader of the SWP James P. Cannon later said that he did not believe the split to be definitive and final, the two groups did not reunite. A new International Executive Committee was appointed, which came under the increasing influence of the Socialist Workers Party. The Fourth International was hit hard during World War II. Trotsky was assassinated, many of the FI's European affiliates were destroyed by the Nazis and several of its Asian affiliates were destroyed by the Empire of Japan. The survivors, in Europe, Asia and elsewhere, were largely cut off from each other and from the International Secretariat. The new secretary, Jean Van Heijenoort (also known as Gerland), was able to do little more than publish articles in the SWP's theoretical journal Fourth International. Despite this dislocation, the various groups sought to maintain links and some connections were kept up throughout the early part of the war by sailors enlisted in the U.S. Navy who had cause to visit Marseilles. Contact was steady, if irregular, between the SWP and the British Trotskyists, with the result that the Americans exerted what influence they had to encourage the Workers' International League into the International through a fusion with the Revolutionary Socialist League, a union that had been requested by the Emergency Conference. In 1942, a debate on the national question in Europe opened up between the majority of the SWP and a movement led by Van Heijenoort, Albert Goldman and Felix Morrow. This minority anticipated that the Nazi dictatorship would be replaced with capitalism rather than by a socialist revolution, leading to the revival of Stalinism and social democracy. In December 1943, they criticised the SWP's view as underestimating the rising prestige of Stalinism and the opportunities for the capitalists to use democratic concessions. The SWP's central committee argued that democratic capitalism could not revive, resulting in either military dictatorship by the capitalists or a workers' revolution. It held that this would reinforce the need for building the Fourth International, and adhered rigidly to their interpretation of Trotsky's works. The wartime debate about post-war perspectives was accelerated by the resolution of the February 1944 European Conference of the Fourth International. The conference appointed a new European Secretariat and elected Michel Raptis, a Greek resident in France also known as Michel Pablo, the organisational secretary of its European Bureau. Raptis and other bureau members re-established contact between the Trotskyist parties. The European conference extended the lessons of a revolution then unfolding in Italy, and concluded that a revolutionary wave would cross Europe as the war ended. The SWP had a similar perspective. The British Revolutionary Communist Party (RCP) disagreed and held that capitalism was not about to plunge into massive crisis but rather that an upturn in the economy was already underway. A group of leaders of the French Internationalist Communist Party (PCI) around Yvan Craipeau argued a similar position until they were expelled from the PCI in 1948. In April 1946 delegates from the principal European sections and a number of others attended a "Second International Congress". This set about rebuilding the International Secretariat of the Fourth International with Michel Raptis appointed Secretary and Ernest Mandel, a Belgian, taking a leading role. Pablo and Mandel aimed to counter the opposition of the majorities inside the British Revolutionary Communist Party and French Internationalist Communist Party. Initially, they encouraged party members to vote out their leaderships. They supported Gerry Healy's opposition in the RCP. In France, they backed elements, including Pierre Frank and Marcel Bleibtreu, opposed to the new leadership of the PCI – albeit for differing reasons. The Stalinist occupation of Eastern Europe was the issue of prime concern, and it raised many problems of interpretation. At first, the International held that, while the USSR was a degenerated workers' state, the post-World War II East European states were still bourgeois entities, because revolution from above was not possible, and capitalism persisted. Another issue that needed to be dealt with was the possibility that the economy would revive. This was initially denied by Mandel (who was quickly forced to revise his opinion, and later devoted his PhD dissertation to late capitalism, analysing the unexpected "third age" of capitalist development). Mandel's perspective mirrored uncertainty at that time about the future viability and prospects of capitalism, not just among all Trotskyist groups, but also among leading economists. Paul Samuelson had envisaged in 1943 the probability of a "nightmarish combination of the worst features of inflation and deflation", worrying that "there would be ushered in the greatest period of unemployment and industrial dislocation which any economy has ever faced". Joseph Schumpeter for his part claimed that "[t]he general opinion seems to be that capitalist methods will be unequal to the task of reconstruction". He regarded it as "not open to doubt that the decay of capitalist society is very far advanced". The Second World Congress in April 1948 was attended by delegates from 22 sections. It debated a range of resolutions on the Jewish Question, Stalinism, the colonial countries and the specific situations facing sections in certain countries. By this point the FI was united around the view that the Eastern European "buffer states" were still capitalist countries. The Congress was especially notable for bringing the International into much closer contact with Trotskyist groups from across the globe. These included such significant groups as the Revolutionary Workers' Party of Bolivia and the Lanka Sama Samaja Party in what was then Ceylon, but the previously large Vietnamese Trotskyist groups had mostly been eliminated or absorbed by the supporters of Ho Chi Minh. After the Second World Congress in 1948, the International Secretariat attempted to open communications with Josip Broz Tito's regime in Yugoslavia. In their analysis, it differed from the rest of the Eastern Bloc because it was established by the partisans of World War II who had fought against Nazi occupation, as opposed to by Stalin's invading armies. The British RCP, led by Jock Haston and supported by Ted Grant, were highly critical of this move. The Third World Congress in 1951 resolved that the economies of the East European states and their political regimes had come to resemble that of the USSR more and more. These states were then described as deformed workers states in an analogy with the degenerated workers state in Russia. The term deformed was used rather than degenerated, because no workers' revolution had led to the foundation of these states. The Third World Congress envisaged the real possibility of an "international civil war" in the near future. It argued that the mass Communist parties "may, under certain favourable conditions, go beyond the aims set for them by the Soviet bureaucracy and project a revolutionary orientation". Given the supposed closeness of war, the FI thought that the Communist Parties and social democratic parties would be the only significant force that could defend the workers of the world against the imperialist camp in those countries where there were mass forces. In line with this geopolitical perspective, Pablo argued that the only way the Trotskyists could avoid isolation was for various sections of the Fourth International to undertake long-term entryism in the mass Communist or Social Democratic parties. This tactic was known as entrism sui generis, to distinguish it from the short-term entry tactic employed before World War II. For example, it meant that the project of building an open and independent Trotskyist party was shelved in France, because it was regarded as not politically feasible alongside entry into the French Communist Party. This perspective was accepted within the Fourth International, yet sowed the seeds for the split in 1953. At the Third World Congress, the sections agreed with the perspective of an international civil war. The French section disagreed with the associated tactic of entryism sui generis, and held that Pablo was underestimating the independent role of the working class parties in the Fourth International. The leaders of the majority of the Trotskyist organisation in France, Marcel Bleibtreu and Pierre Lambert, refused to follow the line of the International. The International leadership had them replaced by a minority, leading to a permanent split in the French section. In the wake of the World Congress, the line of the International Leadership was generally accepted by groups around the world, including the U.S. SWP whose leader, James P. Cannon, corresponded with the French majority to support the tactic of entrism sui generis. At the same time, however, Cannon, Healy and Mandel were deeply concerned by Pablo's political evolution. Cannon and Healy were also alarmed by Pablo's intervention into the French section, and by suggestions that Pablo might use the International's authority in this way in other sections of the Fourth International that felt entrism "sui generis" was not a suitable tactic in their own countries. In particular, minority tendencies, exemplified in Britain by John Lawrence and in the U.S. by Bert Cochran, to support entrism "sui generis" hinted that Pablo's support for their views indicated that the International might also demand Trotskyists in those countries adopt that tactic. In 1953, the SWP's national committee issued an Open Letter to Trotskyists Throughout the World and organised the International Committee of the Fourth International (ICFI). This was a public faction which initially included, in addition to the SWP, Gerry Healy's British section The Club, the Internationalist Communist Party in France (then led by Lambert who had expelled Bleibtreu and his grouping), Nahuel Moreno's party in Argentina and the Austrian and Chinese sections of the FI. The sections of the ICFI withdrew from the International Secretariat, which suspended their voting rights. Both sides claimed they constituted a majority of the former International. Sri Lanka's Lanka Sama Samaja Party, then the country's leading workers' party, took a middle position during this dispute. It continued to participate in the ISFI but argued for a joint congress, for reunification with the ICFI. To sum up: The lines of cleavage between Pablo's revisionism and orthodox Trotskyism are so deep that no compromise is possible either politically or organizationally. The Pablo faction has demonstrated that it will not permit democratic decisions truly reflecting majority opinion to be reached. They demand complete submission to their criminal policy. They are determined to drive all orthodox Trotskyists out of the Fourth International or to muzzle and handcuff them. Their scheme has been to inject their Stalinist conciliationism piecemeal and likewise in piecemeal fashion, get rid of those who come to see what is happening and raise objections. Over the following decade, the IC referred to the rest of the International as the "International Secretariat of the Fourth International", emphasising its view that the Secretariat did not speak for the International as a whole. The Secretariat continued to view itself as the leadership of the International. It held a Fourth World Congress in 1954 to regroup and to recognise reorganised sections in Britain, France and the U.S.
Parts of the International Committee were divided over whether the split with "Pabloism" was permanent or temporary, and it was perhaps as a result of this that it did not declare itself to be the Fourth International. Those sections that considered the split permanent embarked on a discussion about the history of the split and its meanings. The sections of the International that recognised the leadership of the International Secretariat remained optimistic about the possibilities for increasing the International's political influence and extended the entrism into social democratic parties which was already underway in Britain, Austria and elsewhere. The 1954 congress emphasised entrism into communist parties and nationalist parties in the colonies, pressing for democratic reforms, ostensibly to encourage the left-wing they perceived to exist in the communist parties to join with them in a revolution. Tensions developed between those who subscribed to the mainstream views of Pablo and a minority that argued unsuccessfully against open work. A number of these delegates walked out of the World Congress, and would eventually leave the International, including the leader of the new British section, John Lawrence, George Clarke, Michele Mestre (a leader of the French section), and Murray Dowson (a leader of the Canadian group). The Secretariat organised a Fifth World Congress in October 1957. Mandel and Pierre Frank appraised the Algerian revolution and surmised that it was essential to reorient in the colonial states and neocolonies towards the emerging guerrilla-led revolutions. According to Robert Alexander, Ernest Mandel has written that an organisation in Indonesia, the Partai Acoma, was affiliate to the FI from 1959 until the 1965 coup in that country. The Sixth World Congress in 1961 marked a lessening of the political divisions between the majority of supporters of the International Secretariat and the leadership of the SWP in the United States. In particular, the congress stressed support for the Cuban revolution and a growing emphasis on building parties in the imperialist countries. The sixth congress also criticised the Lanka Sama Samaja Party, its Sri Lankan section, for seeming to support the Sri Lanka Freedom Party, which they saw as bourgeois nationalists; the U.S. SWP made similar criticisms. In 1962 the IC and IS formed a Parity Commission to organise a common World Congress. The supporters of Michel Pablo and Juan Posadas opposed the convergence. The supporters of Posadas left the International in 1962. At the 1963 reunification congress, the sections of the IC and IS reunified (with two exceptions: the British and French sections of the IC). This was largely a result of their mutual support for Ernest Mandel and Joseph Hansen's resolution Dynamics of World Revolution Today and for the Cuban Revolution. This document distinguished between different revolutionary tasks in the imperialist countries, the "workers' states", and the colonial and semi-colonial countries. In 1963, the reunified Fourth International elected a United Secretariat of the Fourth International (USFI), by which name the organisation as a whole is often still referred. Since the 1963 reunification, a number of approaches have developed within international Trotskyism towards the Fourth International. The reunified Fourth International is the only current with direct organisational continuity to the original Fourth International at an international level. The International Committee and International Secretariat reunified at the 1963 congress, but without the Socialist Labour League and Internationalist Communist Organisation. It is sometimes known as the United Secretariat of the Fourth International (USFI) after the name of its leading committee, although that committee was replaced in 2003. It is also the only current to have continuously presented itself as "the" Fourth International. It is the largest current and leaders of some other Trotskyist Internationals occasionally refer to it as "the Fourth International": ICFI secretary Gerry Healy, when proposing reunification discussions in the 1970s, described it as "the Fourth International"; the International Socialist Tendency also usually refers to it in this way. The International Committee of the Fourth International member groups customarily describe themselves as sections of the Fourth International, and the organisation as a whole describes itself as the "leadership of the Fourth International". However, the ICFI presents itself as the political continuity of the Fourth International and Trotskyism, not as the FI itself. It clearly dates its creation as 1953, rather than from 1938. Some tendencies argue that the Fourth International became dislocated politically during the years between Trotsky's murder and the establishment of the ICFI in 1953; they consequently work to "reconstruct", "reorganise" or "rebuild" it. This view originated with Lutte Ouvriere and the international Spartacist tendency and is shared by others who diverged from the ICFI. For example, the Committee for a Workers' International, whose founders dropped out of the reunified FI after 1965, call for a new "revolutionary Fourth International". Indeed, the Fourth International (ICR) reproclaimed the Fourth International at a congress attended by ICR sections in June 1993. Other Trotskyist groups argue that the Fourth International is dead. They call for the establishment of a new "workers' international" or a Fifth International. In uniting the large majority of Trotskyists in one organisation, the Fourth International created a tradition which has since been claimed by many Trotskyist organisations. Echoing Marx's Communist Manifesto, the Transitional Programme ended with the declaration "Workers – men and women – of all countries, place yourselves under the banner of the Fourth International. It is the banner of your approaching victory!". It declared demands to be placed on capitalists, opposition to the bureaucracy in the Soviet Union, and support for workers' action against fascism. Most of the demands on capitalists remain unfulfilled. The collapse of the Soviet Union occurred, but through a social revolution leading to the restoration of capitalism, rather than the political revolution proposed by the Trotskyists. Many Trotskyist groups have been active in anti-fascist campaigns, but the Fourth International has never played a major role in the toppling of a regime. Those groups which follow traditions that left the Fourth International in its early years argue that, despite initially correct positions, it had little impact. Lutte Ouvriere claims that it "did not survive the Second World War". Workers Liberty, which follows in the third camp tradition established by the Workers Party, holds that "Trotsky and everything he represented was defeated and – as we have to recognise in retrospect – defeated for a whole historical period." Other groups point to a positive impact. The ICFI claim that "the [early] Fourth International consisted mainly of cadres who remained true to their aims" and describes much of the Fourth International's early activity as "correct and principled". The reunified FI claim that "the Fourth International refused to compromise with capitalism either in its fascist or democratic variants." In its view, "many of the predictions made by Trotsky when he founded the Fourth International were proved wrong by history. But what was absolutely vindicated were his key political judgements." ^ a b c d e The Transitional Program. Retrieved November 5, 2008. ^ a b "Manifesto of the Fourth International on the Dissolution of the Comintern", Fourth International, July 1943. ^ Robert Conquest, The Great Terror: A Reassessment, Oxford University Press, 1991, ISBN 0-19-507132-8, p. 418. ^ Joseph Stalin, "Industrialisation of the country and the right deviation in the C.P.S.U.(B. )", Works, Vol.11, pp. 255-302. ^ Leon Trotsky, "Open Letter For The Fourth International", New Militant, August 3, 1935. ^ "Declaration of the Four" Archived 2011-07-18 at the Wayback Machine Archived 2011-07-18 at the Wayback Machine, The Militant, September 23, 1933. ^ John G. Wright, "Trotsky's Struggle for the Fourth International", Fourth International, August 1946. ^ "Trotskyists at Vorkuta: An Eyewitness Report", International Socialist Review, Summer 1963. ^ Mario Kessler, "Leon Trotsky's Position on Anti-Semitism, Zionism and the Perspectives of the Jewish Question", New Interventions, Vol. 5 No. 2, 1994 (transcript of a talk at the AGM of Revolutionary History magazine in October 1993. ^ Arnold Beichman, "How Stalin, the 'breaker of nations,' hated, murdered Jews", Washington Times, August 16, 2003. ^ Trotsky, In Defense of Marxism, New York 1942. ^ a b James P. Cannon, "Factional Struggle And Party Leadership", Fourth International, November 1953; David Holmes, James P. Cannon: His Life and Work. ^ "Emergency Conference of the Fourth International", International Bulletin, Nos. 1 & 2, 1940. ^ a b c Michel Pablo, "Report on the Fourth International Since the Outbreak of War, 1939–48" Fourth International, December 1948 & January 1949. ^ Rodolphe Prager, "The Fourth International during the Second World War" Archived 2005-12-27 at the Wayback Machine Archived 2005-12-27 at the Wayback Machine, Revolutionary History, Vol. 1 No. 3, Autumn 1988. ^ "Resolution On The Unification of the British Section", International Bulletin, Nos. 1 & 2, 1940. ^ The Fourth International During World War II (immediately afterward). ^ Felix Morrow, "The First Phase of the Coming European Revolution", Fourth International, December 1944. ^ "Perspectives and Tasks of the Coming European Revolution", Fourth International, December 1943. ^ "Theses on the Liquidation of World War II and the Revolutionary Upsurge", Fourth International, March & May 1945. ^ "The European Revolution and the Tasks of the Revolutionary Party", Fourth International, December 1944. ^ Martin Upham, The History of British Trotskyism to 1949 (PhD thesis publische online on the Revolutionary History Website). ^ Peter Schwarz, "The politics of opportunism: the 'radical left' in France", World Socialist Web Site. ^ "The Conference of the Fourth International", Fourth International, June 1946. ^ a b Sam Bornstein and Al Richardson, War and the International, London 1986. ^ Alex Callinicos, Trotskyism, Maidenhead 1990. ^ Paul Samuelson, "Full Employment after the war," in S. Harris (ed. ), Post war Economic Problems, London & New York 1943. ^ Joseph Schumpeter, "Capitalism in the post-war world". in S. Harris (ed. ), Post war Economic Problems, London & New York 1943. ^ "The USSR and Stalinism", Fourth International, June 1948. ^ "The Third World Congress of the Fourth International" Archived 2006-03-09 at the Wayback Machine Archived 2006-03-09 at the Wayback Machine, Fourth International, November 1951. ^ "The Fourth International in Vietnam" Archived 2006-02-18 at the Wayback Machine Archived 2006-02-18 at the Wayback Machine, Revolutionary History, Vol. 3 No. 2, Autumn 1990. ^ International Secretariat of the Fourth International, "An Open Letter to Congress, Central Committee and Members of the Yugoslav Communist Party", Fourth International, July 1948. ^ Pierre Frank, "Evolution of Eastern Europe", Fourth International, November 1951. ^ "Theses on Orientation and Perspectives", Fourth International, November 1951. ^ "The International Situation and Tasks in the Struggle against Imperialist War", Fourth International, November 1951. ^ Michel Pablo, "World Trotskism Rearms", Fourth International, November 1951. ^ a b SWP, "Open Letter to Trotskyists Throughout the World", Militant, November 16, 1953. ^ "Resolution forming the International Committee", SWP Internal Bulletin; Michel Pablo, Pierre Frank and Ernest Germain, "Letter from the Bureau of the IS to the leaderships of all sections", November 15, 1953, Education for Socialists Bulletin. ^ "David North addresses Sri Lankan Trotskyists on the 50th anniversary of the ICFI", World Socialist Web Site, November 21, 2003. ^ "Resolution of the International Committee instructing publication of the documents", August 24, 1973, Workers Press, August 29, 1973. ^ International Secretariat: "To all Members and All Organizations of the International Committee", Education for Socialists Bulletin. ^ Michel Pablo, "The Post-Stalin 'New Course'", Fourth International, March 1953; Michel Pablo, The 4th International: What it is, What it aims at, Publications of the Fourth International, 1958. ^ John McIlroy, "The Revolutionary Odyssey of John Lawrence", What Next, No. 26, 2003. ^ Pierre Frank, The Fourth International: The Long March of the Trotskyists, London 1979. ^ a b "Trotskyism and the Cuban Revolution: A Debate", Intercontinental Press, May 11, 1981, on the What Next? website. ^ a b Farrell Dobbs and Joseph Hansen, Reunification of the Fourth International, International Socialist Review 1963. ^ Ernest Mandel and Joseph Hansen, "Dynamics of World Revolution Today" Archived 2011-07-28 at the Wayback Machine Archived 2011-07-28 at the Wayback Machine, International Socialist Review, Fall 1963. ^ Alex Callinicos, "Regroupment, Realignment, and the Revolutionary Left" Archived 2006-05-15 at the Wayback Machine Archived 2006-05-15 at the Wayback Machine, IST Discussion Bulletin, No. 1, July 2002. ^ "About the International Committee of the Fourth International" Archived 2006-05-15 at the Wayback Machine Archived 2006-05-15 at the Wayback Machine, World Socialist Web Site. ^ Peter Schwarz, "Meetings on 50 years of the International Committee of the Fourth International", World Socialist Web Site. ^ Peter Taaffe, A Socialist World is Possible: The history of the CWI Archived 2005-07-22 at the Wayback Machine Archived 2005-07-22 at the Wayback Machine, Committee for a Workers' International. ^ "Manifesto of the 4th World Congress", on the Socialist Organizer website. ^ "Forward to the Fifth International!" Archived 2006-05-19 at the Wayback Machine Archived 2006-05-19 at the Wayback Machine, on the League for the Fifth International website. ^ Sean Matgamna, "What we are, what we do and why we do it" , Solidarity 3/72, April 28, 2005. ^ David North, "Ernest Mandel, 1923–1995: A critical assessment of his role in the history of the Fourth International" Archived 2006-06-26 at the Wayback Machine Archived 2006-06-26 at the Wayback Machine, World Socialist Web Site. ^ "The Fourth International" Archived 2008-09-28 at the Wayback Machine Archived 2008-09-28 at the Wayback Machine, International Socialist Group website. Death Agony of the Fourth International. Workers Power and the Irish Workers Group. 1983. On the League for a Fifth International Website. Retrieved June 21, 2008. Robert J. Alexander, International Trotskyism, 1929–1985: A Documented Analysis of the Movement. Duke University Press, 1991. The Organizer [Alan Benjamin], Toward a Balance Sheet of the Fourth International in the United States. Retrieved April 26, 2014. Alex Callinicos, Trotskyism, Open University Press, 1990. Retrieved June 21, 2008. Pierre Frank, The Fourth International: The Long March of the Trotskyists, Ink Links, 1979. Retrieved June 21, 2008. Ernest Mandel, "The Reasons for Founding the Fourth International And Why They Remain Valid Today", from E. Mandel, Revolutionary Marxism and social reality in the 20th century. Humanities Press, 1994. Retrieved June 21, 2008. Francois Moreau, Combats et débats de la Quatrième Internationale. Québec, Vents d'Ouest, 1993. David North, The Heritage We Defend  (1988) ISBN 0-929087-00-3, 539pp., a history of the Fourth International. 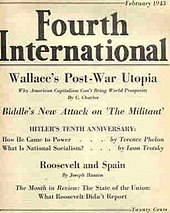 Jean van Heijenoort, "The Origins of the Fourth International", on the Socialist Organizer Website; also at Marxists.org. Retrieved June 21, 2008.